The Cowan Report: Will Middlesborough’s Mr. Paul Bristow Get H&F’s Cllr. Paul Bristow To Sort Out The Gritting? Will Middlesborough’s Mr. Paul Bristow Get H&F’s Cllr. Paul Bristow To Sort Out The Gritting? I slipped over and broke my leg two years ago in conditions just like this. 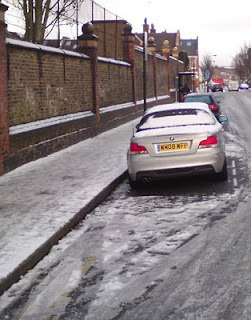 So I am a little fed up that, just like last year, H&F Council has failed to grit the pavements and many local roads - as these photos taken this morning very much demonstrate. It's now nearly four days since the snow first fell. Clearly, the elderly and infirm will find this particularly difficult. But, I was pleased to see that a Conservative Parliamentary Candidate for Middlesbrough South & East Cleveland is concerned how the Tees Valley councils have dealt with the much heavier snow falls in that northern constituency - much of it rural. Mr. Paul Bristow is disgusted by those local authorities saying "There has been considerable criticism throughout the Tees Valley about the lack of gritting and snow clearance by the local authorities responsible, especially on side streets and pavements. In Middlesbrough and Redcar and Cleveland there has been, at best, minimal gritting on main roads only. 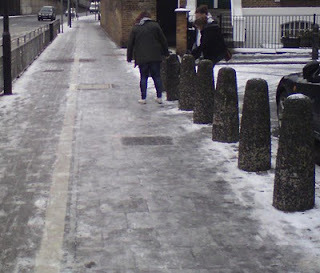 Pavements are particularly treacherous with many residents unsure if they are supposed to clear the path outside their home... we hear the same excuses every year." Quite right!!! But wait a minute… If you look carefully at the pictures on the Conservative candidate for Middlesborough's website, this chap Mr. Paul Bristow looks very much like our own Cllr. Paul Bristow (Con), the Cabinet Member for Residents Services. Surely there’s been some mistake? I live in Rainville Road which makes him my councillor. It is like a skating rink around here. It is the same in all the surrounding streets but there's not been a squeek out of Paul Bristow and nothing is being done. No grit. He is doing nothing. They repeating the mistake from last year bad weather H%F. What Streets need is like a big box each street with Salt in them so many of the public who live there can do it. He should be out there personally gritting the whole borough! With salt and a shovel!